On Saturday I attended the Southampton Blogger Meet Up. This was my first ever meet up and I was super excited and nervous when the day finally rolled around but I had an absolutely fantastic time. It was lovely to just chat all things beauty, fashion and lifestyle over a few drinks and something to eat with people who know exactly where you are coming from. The event was held in Southampton’s Orange Rooms and was hosted and organised by the lovely Alice and Amy who did an absolutely fantastic job setting up the event. In the lead up to the event we were all busy tweeting away using the hastag #sotonmeetup to stay up to date on all the latest South Coast news. The first few hours was a lovely opportunity to chat to fellow bloggers about their likes/dislikes, favourite bloggers, hints and tips for content and photography and just general girly chatter. Following this, Alice had managed to get some fantastic brands on board for the day who were their to offer expert advice and the ever so important blogger product snaps. Chatting to the companies was really interesting and eye opening as this was my first real interaction with PR brands. Bee Good: Bee Good is a local Hampshire Based skincare company which was started by Husband and Wife team, Simon and Caroline (who were in attendance). All the products are naturally sourced from British Bee’s wax, honey and natural oils. In our Goodie Bags we werc given the Vanilla and Honey Lip Balm which smells incredible. I also tried the Honey, Borage and Echium Intensive Hand Repair Cream which was fantastic and left my skin feeling so soft – I can feel a online purchase coming on here! Weleda: Weleda is a multinational company which produces both beauty and medicinal products for a tonne of different countries. They are dedicated to providing natural products to its consumers. We tried the differences between Vaseline and various products and they blend in so much more and don’t sit on top of the skin. The almond oil is really nice and the Bath Milk that Simon Cowell raves about smells delicious and looks extremely soothing. Oloves: Oloves produce and sell olives in super cute and extremely handy pouches, perfect for lunchtime or snacks at work. Suitable for Vegetarians and Vegans they are perfect for people on a healthy diet. Being a full-time worker I find it hard to find the energy to create healthy meals and snacks but this will be perfect for work. Lush Southampton: If you’re a blogger and haven’t tried/heard of Lush you must be living under a rock! It is fast become a staple for any blogging haul or shopping trip. 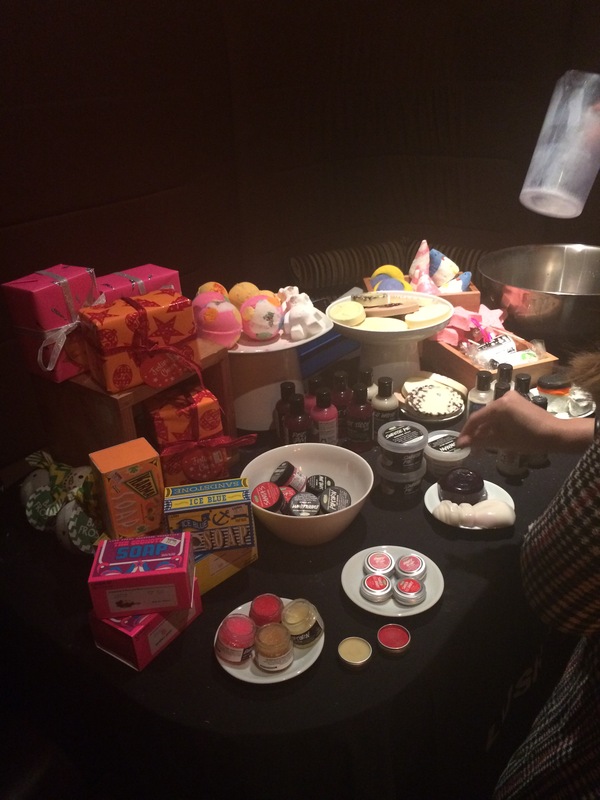 Lush is a company dedicated to bringing you fresh products (some even have a use by date!) and are completely against animal testing. I absolutely adore going in to the Southampton store and having a mooch around, it always smells incredible. Two of the lovely representatives explained some of the products that I hadn’t quite yet managed to get to grips with including the Shower Jelly’s and they had an extensive collection of products on show. Overall the #sotonmeetup was a wonderful day. It was brilliant meeting some fellow bloggers and I hope we can all meet up again sometime soon.